Acting Schools can be expensive and slow. Your acting technique must deliver results instantly in auditions and must show specific character depth that can only be recognized and achieved by putting SENSE MEMORY into your audition monologues and cold reading audition scripts. Stop risking your acting reputation in open casting calls and acting agencies on incomplete and non-specific acting school training and weak acting auditions script preparation technique, it can take up to two years to get a second chance. Remember my coaching is fast, convenient and is available anywhere in the world. Whether you are preparing for local acting auditions, preparing to travel to Los Angeles or New York for a major acting career or simply trying to avoid the major time and expense commitment of college or university programs, why would you pay $20,000 for four years or even $2500 for one year, when about $200 will do 90% of the job in less than two hours? Legendary Acting Coach and Golden Globe nominee John Sarno with over 35 years of experience has coached over 500 stars in classes and private lessons in these techniques. If you were to get coaching from John you would have to buy a plane ticket, pay for private lessons and or enroll in his weekly classes. Well the cost of a plane ticket to Hollywood we imagine would run into Hundreds of dollars depending on where you live in the country, private lessons run $100-$150 an hour, and classes $250 to $400 a month! You may want to run some figures in your own mind on what it would cost you? Imagine learning the Hollywood Secrets of how to correctly break down any script for commercials, voiceover, TV, Stage or film, and learn your lines without memorizing them wrong, because as Famous Acting Coach and Academy Award winner Lee Strasberg said, when you memorize the lines you kill the imagination. Learn the hidden art of cold reading and much more. 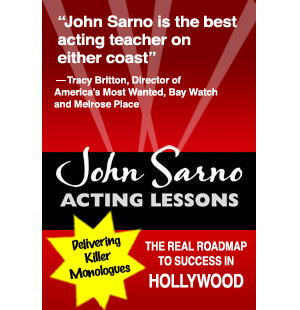 As an added bonus the Famous Acting Exercises DVD is included with every full set ordered. All lessons are taught in a raw workshop setting so you can learn along with John and his students. 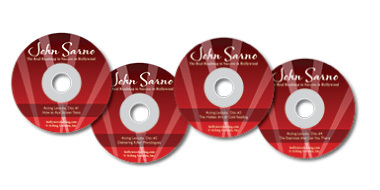 As we noted earlier the value of these dvds and information could easily have run you close to a $1000 dollars but since his passing in 2015 you can no longer access John and his teachings except through these DVDs or his only teaching student, producer, director and co-writer of these DVDs, Michael Profunato who resides and teaches only in Las Vegas Nevada? The information is still available and preserved for you in these DVDs, so Isn’t time you invested in yourself! All great accomplishments begin with a dream. How many of you have dreamed of becoming an actor? And How many of you know someone who has dreamed of becoming an actor? You might ask yourself another question that may go something like where do I start?, and how do I begin? All great actors have techniques they use to find the character, learn their lines, channel their energies, access their sense memory etc. 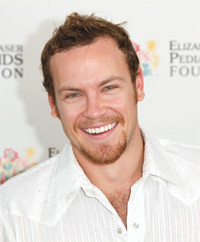 Actors must have a technique and they must be able to go there when directed whether in a movie, commercial, or a play. These techniques even enhance job interviews and presenting when in front of groups. The suggested retail price for the entire set is $489.00 but we want you to have it and so have lowered the investment for the holidays to $375.00 (Profunato students, call for special class discounts 800-261-9063 or email michael@profunato.com). so invest in your future now and live the real American dream of being an actor or voiceover talent in radio, TV, commercials or Film; even videogames and animation! Perhaps we will meet on a set someday, , privately, or at one of my workshops or classes in Las Vegas, NV? Start Learning to Act Today!